Shalmaneser III (Šulmānu-ašarēdu, "the god Shulmanu is pre-eminent") was king of Assyria (859–824 BC), and son of the previous ruler, Ashurnasirpal II. His long reign was a constant series of campaigns against the eastern tribes, the Babylonians, the nations of Mesopotamia and Syria, as well as Kizzuwadna and Urartu. His armies penetrated to Lake Van and the Taurus Mountains; the Hittites of Carchemish were compelled to pay tribute, and the kingdoms of Hamath and Aram Damascus were subdued. It is in the annals of Shalmaneser III from the 850's BC that the Arabs and Chaldeans first appear in recorded history. 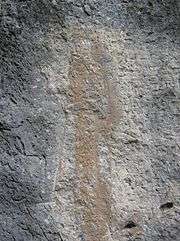 Kurkh stela of morates the battle of Carcar. In 853 BC, a coalition was formed by 11 states, mainly by Hadadezer (Hadad-ezer) the Aramean king of Damascus, Irluheni king of Hamath, Ahab king of Israel, Gindibu king of the Arabs, and some other rulers who fought the Assyrian king at the Battle of Qarqar. The result of the battle was not decisive, and Shalmaneser III had to fight his enemies several times again in the coming years, which eventually resulted in the occupation of The Levant (modern Syria and Lebanon), Arabia and Israel by the Assyrian empire. Jehu bows before Shalmaneser III. In 842 BC, Shalmaneser campaigned against Hadadezer's successor Hazael, forcing him to take refuge within the walls of his capital. While Shalmaneser was unable to capture Damascus, he devastated its territory, and Jehu of Israel (whose ambassadors are represented on the Black Obelisk now in the British Museum), together with the Phoenician cities, prudently sent tribute to him in 841 BC. Babylonia had already been conquered, including the areas occupied by migrant Chaldaean, Sutean and Aramean tribes, and the Babylonian king had been put to death. In 836 BC, Shalmaneser sent an expedition against the Tibareni (Tabal) which was followed by one against Cappadocia, and in 832 BC came another campaign against Urartu. In the following year, age required the king to hand over the command of his armies to the Tartan (turtānu commander-in-chief) Dayyan-Assur, and six years later, Nineveh and other cities revolted against him under his rebel son Assur-danin-pal. Civil war continued for two years; but the rebellion was at last crushed by Shamshi-Adad V, another son of Shalmaneser. Shalmaneser died soon afterwards. Despite the rebellion later in his reign, Shalmanesar had proven capable of expanding the frontiers of the Neo-Assyrian Empire, stabilising its hold over the Khabur and Mountainous frontier region of the Zagros, contested with Urartu. His reign saw the first appearance in history of the camel-mounted Arabs. His reign is significant to Biblical studies because two of his monuments name rulers from Hebrew Bible. The Black Obelisk names Jehu son of Omri (although Jehu was misidentified as a son of Omri), and the Kurkh Monolith names king Ahab, in reference to the Battle of Qarqar. 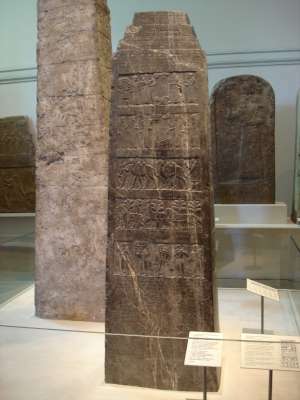 Black Obelisk of Shalmaneser III in the British Museum. He had built a palace at Calah, and left several editions of the royal annals recording his military campaigns, the last of which is engraved on the Black Obelisk from Calah. The upper end of the Black Obelisk of Shalmaneser III, from Nimrud, Mesopotamia.. The Black Obelisk is a significant artifact from his reign. It is a black limestone, bas-relief sculpture from Nimrud (ancient Kalhu), in northern Iraq. It is the most complete Assyrian obelisk yet discovered, and is historically significant because it displays the earliest ancient depiction of an Israelite. On the top and the bottom of the reliefs there is a long cuneiform inscription recording the annals of Shalmaneser III. It lists the military campaigns which the king and his commander-in-chief headed every year, until the thirty-first year of reign. Some features might suggest that the work had been commissioned by the commander-in-chief, Dayyan-Assur. It was erected as a public monument in 825 BC at a time of civil war. It was discovered by archaeologist Sir Austen Henry Layard in 1846. ↑ "Black Obelisk of Shalmaneser II". Mcadams.posc.mu.edu. Retrieved 26 October 2012. Black Obelisk of Shalmaneser III Babylonian and Assyrian Literature.